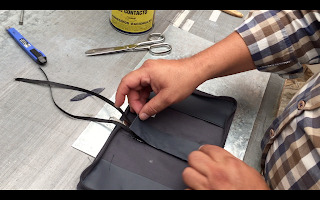 Ministry Ideaz: Have a sneak peek at how your Bible cover was handcrafted! 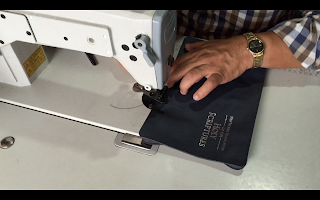 Take a look “behind the scenes” at how we’ve handcrafted your genuine cowhide Bible cover. Even though the video is abbreviated to about five minutes, the entire process takes about an hour. Don’t forget to leave a comment when you’re done! Of course, we make a lot more than Bible covers. This video will give you an idea of how all our products are manufactured. Here at Ministry Ideaz, we use only the finest of leather made from 100% genuine cowhide. As a natural product, minimal scars and marks occur innately in cowhide. That’s why we thoroughly inspect the materials for various imperfections following a strict set of guidelines. This inspection is done to ensure the hide is of top quality, as the condition of the leather is the foundation of our first-class products used in over 180 countries. Our genuine leather products come in two grades: elegant and rustic. The elegant grade is delicate while the rustic grade is more robust. The grades and many colors of leather products we offer let us appeal to the varying tastes of you, our customers. 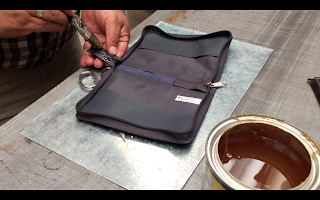 The cover-making process includes the use of a foil-embossing press, a sewing machine, a hammer, glue, a small knife, and other various small tools. We to prepare each cover with patience, precision, and excellence. We never use “bonded leather.” Bonded leather is made with pieces of scrap leather boiled and placed in a mold to create a larger piece. While such a technique does technically create leather, Ministry Ideaz does not use such methods in the making of our luxury leather goods known the world over. Many of our competitors use bonded leather which is why their products cost less. However, it is much less durable. For many folks, spending more on a genuine leather product offers a great value over the long term, even if the initial purchase cost is higher. wow there are so many small details I didn't know about. Thanks for the video. I absolutely loved this! I've bought a couple of the leather covers and am always impressed by the craftsmanship that goes into them. The attention to detail when it came to the corners is fascinating. Every product is well worth the price. That is a lot of handwork. Truly awesome. What skill. I really appreciate the wonderful way the cover is put together and the ability the person showed in making it look easy. It isn't easy. So well made. Thank you for sharing that story. I am from the USA. That was truly amazing how the craftsman was so detailed in making a leather cover! His skill and finished product is truly amazing. To see the work that goes into making a leather cover astounds me. Thank you for sharing this with us!! It's nice to see the artistry that goes into each cover...an amazing talent to be sure. Amazing! Appreciate your products even more now. Thank you. I have a newfound appreciation for "attention to detail" after watching the video. It now surprises me that the cost is not more. I have purchased similar coverings from you, but without the script on front. Thanks for sharing! I took a bookbinding class and have made a number of Bible covers, so I really appreciate all the hard work...plus the how-to for those rounded corners...that was awesome!!!! Who takes care like that in the world....to make something so beautiful to wrap around the most wonderful possession one could own. Thank you so much! Amazing how much work goes into each piece. What a great craftsman. Enjoyed this video. I may try a Bible cover! Really makes you appreciate the work that goes into each one! Thank you for sharing this video with us. Thanks for sharing this - such beauty in seeing how the Bible cover is produced by the creative handiwork of this craftsman. I will value mine even more! So enjoyed the step-by-step process and the personal care that goes into making each piece. A satisfying work I'm sure for the purpose of making our Bibles beautiful and durable for use in the ministry. Thank you for the video! 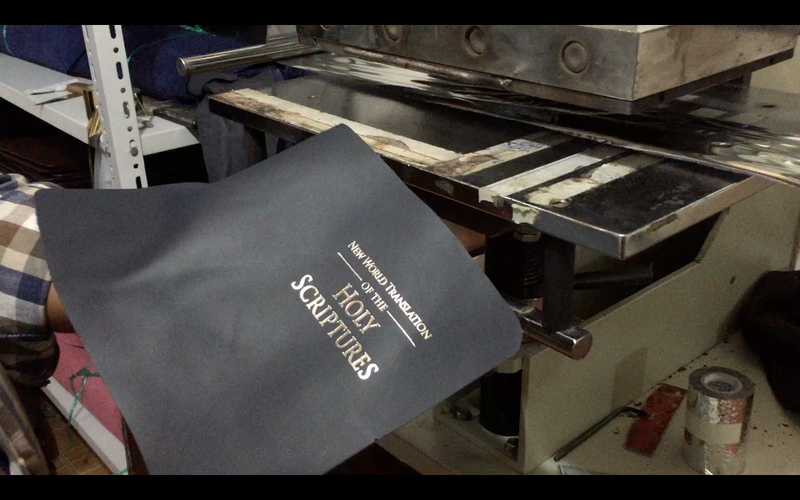 Enjoyed watching the making of a Bible cover. Thanks for sharing it truly shows the artistsan's love for their work. I don't own one but have seen others with your products. 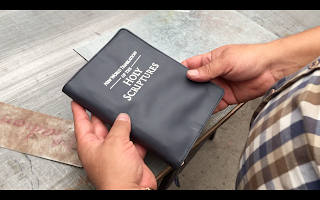 I have a leather biblecover, after viewing the video. I truly appreciate the detail that goes to making it. Not an assembly line. So I now understand the time and energy it takes to making one cover. Thank u for sharing. Thank you for sharing this video and offering great products! 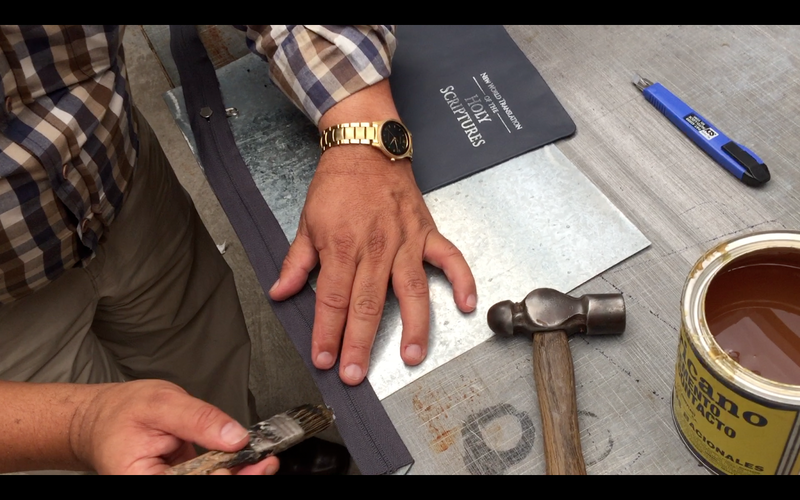 It was very enlightening to see the work and craftmanship that goes into each cover. Beautiful, and worth the price! Thanks for sharing! Amazing how much attention to detail is given to each cover. This video made me smile the whole way through watching those dear hands create this wonderful gift. Thank you !! This was awesome!! The amount of careful and skilled workmanship is wonderful. Thank you so much for all your hard work providing us with the tools we need to carry out our ministry to Jehovah! Nice video. I loved the music that went with it. But don't know if i saw a coupon code at the end of the video. Did anyone catch? Thank you for all that beautiful workmanship! That was ...amazing! I knew the process involved some work by hand, but didn't realize just how much; had always imagined that it was probably a bit more automated than it really is. Thank you for such a lovely video. WOW!! I had no idea of the work involved. Really great skill shown by the brother! Thank you for sharing. I am from Australia, and I have had a Bible cover for over 12 years. I was pioneering for several of them, and my now 3yr old loves the cover so much that I had to give it to him... despite the 'age' you would never know! The quality is such that it still looks almost as good as new! Thank you so much for making such good products! Now I know why they hold up so well. Wonderful! Such skills are being lost in these last days! It's so good to see a great artisan at work! Absoluteley fantastic, very well made, dilligent effort shown in the making of the Bible cover! Wow, I see why you wanted us to see how these beautiful covers are made. So labor intensive and truly handmade! Brothers, Thank you for your labor of love. Wish I could visit you. In the New World all our world wide brotherhood will be a delight to get to know each individual. Stay faithful. Thank you very much for this amazing video. You put so much work into your products. Thanks for all you do for us. Thank you Bros. I found it fascinating how the covers are made. I love the ones I have and being a craft person myself, I appreciate all the handwork that goes into making the covers. Good job. Thank you for your hard work! Amazing work, loved watching the video of how these great products are made. Thank you for all your work. I have had one of your zippered leather Bible covers for at least three years. It is handsome and protects my Bible perfectly. Thank you for the behind-the-scenes look at your craftsmanship. Very interesting! I have 2 bible covers and have found them to be great for keeping my Bible safe. Knowing all the details that go into making a bible cover makes it all the more special in having one. Thank you for showing how this is done. Seeing the care and detail that goes into making one item (the music made it even more moving), my appreciation for your work is now magnified. Thank you for letting me see behind the scenes. I love you! It's so nice to see the craftsmanship that goes into your work. Sometimes we look at only the final cost of the product we order and think, "why does it cost so much?" True craftsmanship will cost a little more, but you will not find such quality at your local mall. Would we rather pay once for a high quality product, or pay many times for products that fall apart soon after we purchase them? We really save in the long run. Thank you! I didn't realize these were actually hand made, thought it was mass produced. Great video. Build loyalty w/ love when we think about good qualities in our mate & others, thus build's loyalty. Your prices are reasonaable & competitive! I shop from you mostly because of the style, format, quality but mostly genuine Christ like personality I see in your 'family' business. Always love your products. Video just reinforces the quality of workmanship that goes into your products. I buy all my products from you and am always happy and use them in the A.Pioneering work and at meetings. Tell everyone to visit your site. Cathy P.
It's a real pleasure to watch a skilled craftsman at work. I look forward to the time when everything we use will be made with the same care and pride of workmanship I saw in the video. Bless you for the help Ministry Ideaz gives us to preach the good news. Enjoyed watching the video. Very interesting. I've been sewing for myself and my family since I was a young girl and I truly appreciate the time, effort and expertise that your company/employees put into handcrafting these beautiful Bible covers. Keep up your fine work! Nice to see the loving care that goes into producing your superb Bible covers. Thanks so much. Thanks for the video it was very nice to see the work that went into the process of making the covers. I intend to save this video to show to others. Well done! Loving hands & diligent craftsmanship, Thank You so much! Imagine what it will be like in the New World - handmade everything...Awesome! I live in The United States, I think it is wonderful and very humble, and loving the way you all make the Bible covers. I never realized all the work involved. It is a lot more work than I ever thought. Beautiful work. Thank you for a very informative video. I had no idea each one was handcrafted and with such skill and care. I'm impressed. I also appreciate the hard work and expertise with the Bible covers I have given many as gifts to Bible Students and their children. Just to see their eyes light up and a great big smile makes my heart melt. They treasure the Bible and even more so because I always express to keep the Bible neat and clean because it's a wonderful gift from Jehovah. I also encourage them to read it daily and they are doing this which makes me so happy and I'm sure Jehovah is very happy. Beautiful video, there is nothing I love more than seeing a man work with his hands to support his family and ministry. That was a beautiful video. I love my Bible cover very much. I'm especially happy that it's the same grey as the Bible made by Jehovah's organization. Thank you for all your hard work and attention to detail. Thank you for sharing this process with your customers and prospective customers. I've owned one of your gray leather zippered covers for about 2 years and have loved it. Since I'm a pioneer, however, I found it difficult to keep clean so I've just ordered a maroon one. I'm looking forward to receiving it. Thank you for all your hard work. Very interesting to see how much work and care you put into making the Bible covers. Your quality shows. May Jehovah continue to bless the spirit you show. This is so amazing. Thank you for sharing with me what you do for us! 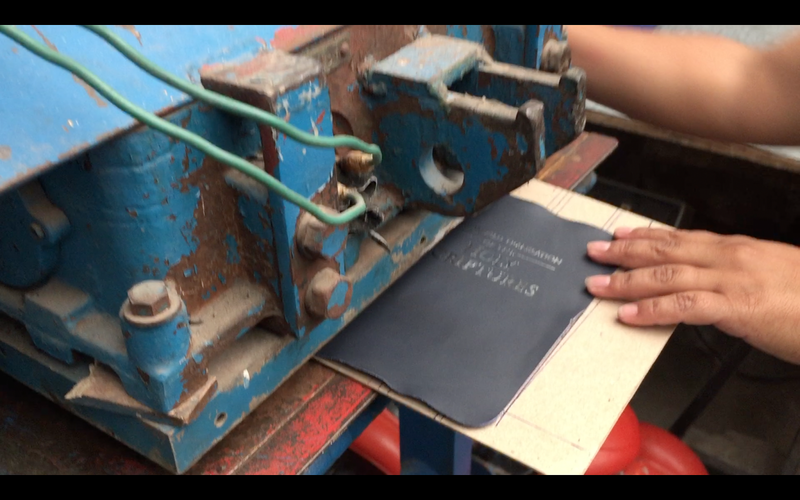 So enjoyed watching the Bible cover being made, such workmanship! and a work of love and pride too. Thank you for sharing this. My great grandfather was a shoemaker. I've always been fascinated by bookmarking and leather crafting, I've watched this video several times, please post to Facebook so I can share with my friends. Wow, I had no idea what it took to make a cover so I enjoyed watching the process. Thanks for sharing! Keep up the fine work, friends! I just wanted to thank you all for such impressive, durable and good looking products. I have been ordering for some years now, and you just continue to out-do yourselves with your products for the friends worldwide. 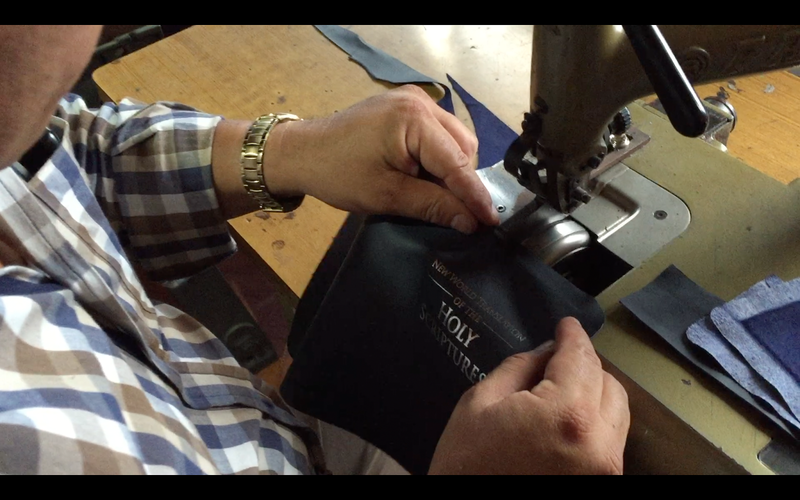 How comforting to watch the video of the meticulous assembly of our bible covers. Thank you so much for all that you do for our Worldwide Brotherhood. Continue in the work as need-greaters and may Jehovah continue to bless the efforts you put forth. What a stirring example of how Jehovah can enhance natural skills! No wonder your covers are so exquisite! Looking forward to receiving my bag and Bible cover after watching the video. I am in AZ USA. I have several of your Bible covers in several colors. All are excellently made. I enjoyed the video. Recently I placed another order and was told that you won't have Bible covers much longer. I am sorry to hear that because everyone I show mine too love them and would like to get some for themselves. Maybe you will reconsider and continue to manufacture them. Price is not the issue, but more importantly, you have very good quality. Thank you. I truly enjoyed watching this video! I will be ordering more of these! :) Thank you so much for your wonderful work and quality products. Friends thank you for making these BEAUTIFUL products for us and helping us praise Jehovah's name to all the nations! Thank you for all your good work.The products are very fine and a praise to our God,Jehovah.They are so practical and usable in the field.